A range of metal cased PTFE lip rotary seals for use on rotating shaft equipment which bridge the gap between current technologies for both gas and liquid sealing applications. The economy of conventional rubber lip seals must be weighed against their limitations for applications involving extremes of temperature, speed or pressure, particularly when combined with hostile operating conditions. However, there is no longer any need to involve the cost of bulky, multi-component mechanical face seals to handle these requirements. Our compact metal cased PTFE lip rotary seals are not only economical, but they also offer impressive operating characteristics. They can run at speeds of 30 metres/sec, and cope with pressures up to 35 bar and temperatures from -20°C to + 250°C. They are resistant to chemical attack, have low friction characteristics and are designed to ensure long seal life even in conditions of no lubrication or when used with abrasive media. A wide range of design configurations can be supplied which includes single or multi lip varieties with optional lip loadings, some with backing springs. Precision manufactured metal components are supplied in a range of alloys and include stainless steel versions where necessary. The seals can also be supplied for contra-rotating shaft applications, even incorporating threaded lip seals to make them particularly suitable for vacuum conditions or low pressure shaft sealing. Within manufacturing limitations, any size seal, inch, metric or a mix of both is available, thus eliminating the need to consult a manufacturers catalogue for tooled sizes. There is no charge for tooling, minimum production quantities or for special tolerances. Extended like for a damaged housing bore or shaft is possible by machining to correct the problem, the selecting one of our seals to meet the new dimensional requirements. Standard Semi-Dual and Dual style seals available in any Outside Diameter from 2.500 inches to 48.00 inches (65mm to 1220mm). Seal Inside Diameter is subject to a minimum producible section. 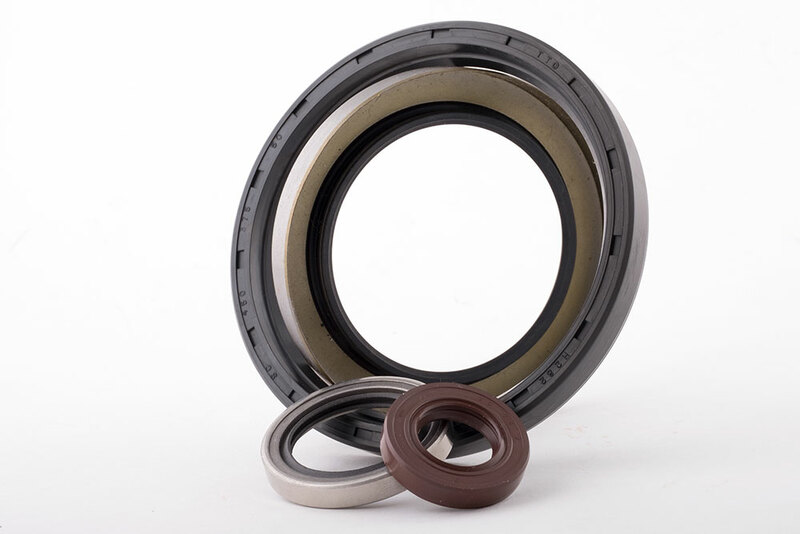 Also known as an oil seal, shaft seal, lip seal, elastomeric lip seal or any variation of these. It is a simple device for excluding dust, dirt, water or any other contaminant whilst retaining lubricant in rotary shaft equipment. Generally it has been developed as a means of protecting the bearings of rotating shafts. The basic principle of sealing is straight forward – the flexible lip is held against the rotating part (usually the shaft) whilst the casing (or O.D.) is pressed into the housing or bore and holds the seal in place. The sealing lip needs some form of lubrication to avoid overheating and is usually energised by means of a garter spring.